Synopsis: Van Amsterdam the baker was well known for his honesty as well as for his fine Saint Nicholas cookies. He always gave his customers exactly what they paid for -- not more, and not less. So, how could he agree with a mysterious old woman on Saint Nicholas Day when she insists that a dozen is thirteen? 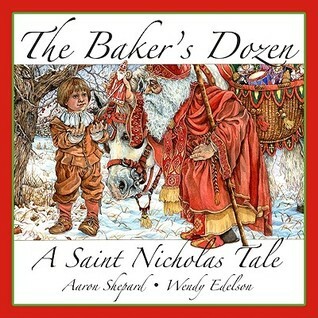 The woman's curse puts an end to the baker's business, and he believes it would take Saint Nicholas to help him. But if he receives that help, will it be exactly what he imagined? About the Author: Aaron Shepard is the award-winning author of "The Sea King's Daughter," "The Legend of Lightning Larry," "The Adventures of Mouse Deer," and many more children's books. His stories have appeared often in Cricket magazine, while his Web site is known internationally as a prime resource for folktales, storytelling, and reader's theater. About the Illustrator: Wendy Edelson has applied her award-winning skills to a wide range of illustration projects, including picture books, pet portraits, posters, puzzles, and fabric design. Her clients have included Seattle's Woodland Park Zoo, the Seattle Aquarium, the Pacific Northwest Ballet, the U.S. Postal Service, and the American Library Association. Review: The story is delightful and the illustrations absolutely blew me away. A great story about the legend of the baker's dozen in the US. I highly recommend this for people of all ages and faiths. The story is about the spirit of giving more than anything religious. A beautiful folk tale that brings alive the spirit of the holidays.